A hundred times a year Donovan Rypkema gives a speech or conducts a workshop – from a paper at an international symposium to a plenary presentation at a national conference, to an after-dinner speech at a local Main Street program’s annual meeting. Copies of some of those speeches, and videos of presentations can be found here. 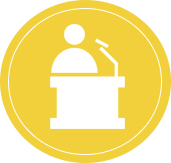 If you have a subject you want covered in a speech, conference presentation, or workshop, or a meeting for which you need a facilitator, let us know. We’ll tell you if that is an area where we have expertise and which of us would best meet your needs. In addition to our longstanding workshops on Community Initiated Development and Feasibility Analysis, we can customize workshops on a wide range of preservation and development related topics.